As many of you know I work with a lot of clients that are trying to lose weight, I have one client in particular that has really been struggling, her struggles are bothersome or upsetting (I’m not sure if that’s the right word, but it’s the one I’ll use) because there was a time when she had made a lot of positive changes in her life, she had a really good grasp on her food consumption, she was exercising regularly, she had even built up enough confidence to join a running group, an exercise bootcamp and she even ran a half marathon. With all these positive changes she made she managed to lose 80 lbs. and she had made a lot of new friends and had found communities that reinforced all these positive changes, which spurred her on and kept her going, but then she injured her back, severely enough that she had to stop running and in fact has to stop walking after only few blocks. Many of her exercises had to be regressed (I hate using that word, but it’s what happened) and she slowly lost touch with these exercise communities she had grown into and become a part of, and as many of you guessed her weight started to slowly creep up again and she regained the 80 lbs. she had lost. Over the last few years she’s gone to a variety of different physios, chiropractors and me trying every exercise I could think of and nothing worked. After all of this she’s just recently resorted to a cortisone shot, which seems to be working. She’s able to move around more freely, walk a little bit more and I was able to give her some glute activation exercises, where she was able to actually feel her glutes and not have pain in her back, for the first time in years she’s on the up and up and I feel good about her chances of moving back towards the exercises she had been doing and losing that weight again. Then this morning, as in the morning I’m recording this, she messaged me a picture of some treats her husband picked up for them to share. 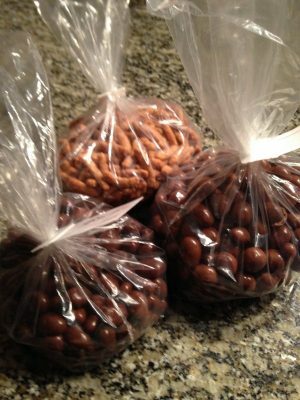 These treats appear to be 3 medium sized bags of chocolate covered almonds, chocolate covered raisins and sesame seed pretzel sticks. Now I’m moderately to mildly enraged, recording a podcast that wasn’t on my schedule this morning, but I pushed some other stuff around, because I want to address this immediately while I’m a little bit hot and it’s all fresh in my mind, now let’s point out the abridged version of the facts I just covered. As soon as this happens her husband brings home a substantial number of sweet treats for them to share together, I call this sabotage. Now to be fair to the husband I don’t believe he is consciously or intentionally trying to sabotage my clients progress, I mean he’s always trying to get them to go out and eat at restaurants together and is constantly bringing home pop, juice and other processed foods, especially refined carbohydrates and sugars. In fact I would even accept the argument that he would have brought this junk food home anyway, regardless of how my client was feeling, but that’s kind of my point, whether he realizes it or not he’s sabotaging the positive lifestyle choices my client and his wife is trying to make and one of the ways she helped work around that in the past was that she joined all these groups to get out of the house and be with people who in many ways were already living in a way she wanted to live and it was rubbing off on her. Obviously this is an extreme example, but I use it because it’s good for the point I’m trying to make. When you reflect on your life and look back on changes you’ve tried or are trying to make, but find it especially challenging, it might be helpful to ask yourself in what ways you’re being sabotaged. Do you live with someone who is constantly bringing food home you know you shouldn’t be eating? Are you trying to get to bed earlier, but the person you live with stays up late with the T.V on so you can hear it or worse watch it in the room you’re trying to sleep in? When you schedule in time to exercise do you have friends trying to direct you to movies, the bar or just visiting instead? Of course this probably isn’t good advice when dealing with spouses, your children or your parents, but it might be exactly what is needed with friends, colleagues and acquaintances. If this is someone you live with, are close to or really care to keep the relationship with then a gentler approach, gentler’s not the right word because you still have to be direct. Maybe direct is the right word, but it’s the context under which you have the conversation that’s important. About a year and a half ago I did an episode about getting partner buy in and I used the example of how at the time my wife Tiffany was buying sweet and salty treats, which was okay for her because she’s able to eat one or two of something, but it’s not okay for me because I have to eat the whole bag. At the time our compromise was I hid it out of sight on the top shelf of the pantry and she forgot it was in there, of course I was the only one who knew about the compromise and it worked, until I released that episode. I didn’t think she was listening to the show anymore, but apparently the title ‘How to get partner buy in’ really peaked her interest and that night when she got home from work she was medium to moderately upset with me, because the night before she had brought some chocolate pretzels or something like that into the house and she thought I had recorded the podcast and released it the next day and was throwing her under the bus, for my inability to control my eating, because if memory serves me correctly I had eaten that entire bag of chocolate pretzels the day she brought it home. Needless to say she was emotional about it, which brings me to this, you can’t have the conversation with the other person in the moment it’s happening because they will be emotional and it’s very likely to end up as one of those heated arguments where nothing gets solved and you just end up mad at each other – we were about to have one of said arguments then I told her that I recorded the episode over a week ago and it was merely a coincidence that it was released on that particular day, which was the truth and it calmed her down, because she started thinking ‘is this something I do all the time’ and as she was thinking and trying to remember she was becoming less emotional and more logically trying to figure out how often she brought that type of food home. This allowed us to have the conversation that really needed to happen, where I explained to her that I’m trying to live a certain way and that unlike her I don’t have the same kind of control when it comes to food and I have to control my environment otherwise the food is just way too tempting, when I’m having a moment of weakness. At the time of this converstaion she wasn’t really ready to change anything, but it got the ball rolling and was the first of many mostly logical, but occasionally emotional conversations that got us on the same page about how we store food and what kind of food we actively purchase to bring into the house, which has ultimately lead to this, if Tiffany brings any food into the house that I would categorize as unhealthy, then she hides it behind food in the pantry, on shelves in containers high above eye level and out of sight or in an opaque container in the freezer. For the most part this has worked, I don’t see it very often therefore I eat a lot less of it, but also she sees a lot less of it and therefore eats less as well, because of this we’ve both lost a bit of weight, but if I hadn’t waited until a moment when we were both logical about it then there’s a chance we would be stuck in that same holding pattern and very possibly in a less happy relationship. I realize in the example of my story I may have made it sound easy, but it really wasn’t there were times when Tiffany felt like I was blaming her for my problems, which there is probably a grain of truth to, it wasn’t just one conversation it was many that spanned over several months, arguably years, but the ones we had the most positive outcomes from were the ones where we were the most logical about it, or where we listened to a podcast or watched a documentary, something neutral and external to our relationship and then had a conversation about what we just listened to or watched and what could we pull out of it to start applying to our lives. Also, this hasn’t just been about food, it’s also been about how many and the types of material possessions we have, it’s been about how we do our financial planning and it’s been about how we intend to try and raise our son. Like I said before I went on this, slight ramble of a story, the context for these conversations is actually what’s important and if you can have these conversations away from the emotion or around a neutral piece of information, it will allow you to move forward in the positive direction you want to go and if all else fails, go back and listen to Episode 54: How to Get Partner Buy In because I have some strategies there that can help you get partner buy in, when they aren’t quite ready to buy, as it were.